Suitable for liquid pouch filling purpose (i.e. Shampoo, Conditioner, etc.). made with 16 swg. 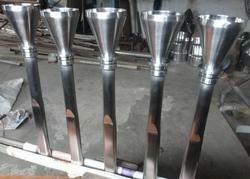 316L Stainless Steel material. This is a manually forming product as per required specification. Upper part of funnel is oval eccentric reducer while lower funnel is very narrow and round joined, below upper part as shown in pic.